Paul Railton had to take the dog for a walk, so he did what any enterprising young man might do in his situation. Quite simply, he figured out a better way to do things. In this case, you roll down the window of your car, and ride alongside Rover while he goes out for a romp. Granted, he got caught taking the dog for a walk behind the wheel and got into trouble for it, but if you don’t get caught, it’s not a crime! The 23-year-old from Conestt, England, got a nice fine and a few points off his license, which caused him to be banned from driving for 6 months due to prior offenses. 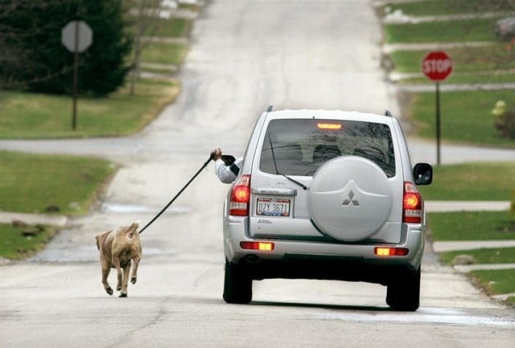 Apparently, if you believe the defense, a lot of people in England exercise their dogs this way. And here I thought America was the laziest country on earth; turns out we’ve got some work to do if we want to catch up with our fat friends in the UK!